I'm a collector. Big time too. But while my collection is the largest in the world for what I collect, I haven't gone overboard to the point that I have trails through the house and my collection is in every room including the bathroom and laundry shute. It's not 12 layers deep because I ran out of room back in 1982 and have been overlaying ever since. I don't go to conventions wearing a jacket that has so many patches you aren't sure if the original material was polyester or fleece. But I do have a crayon collection. I know, I know. You're saying "But VE...that's not very macho for a guy to collect crayons!" Of course, those of us with highly attuned self confidence and lack of common sense can collect something that would be written up in Lady's Home Journal and not think twice about our manlihood. 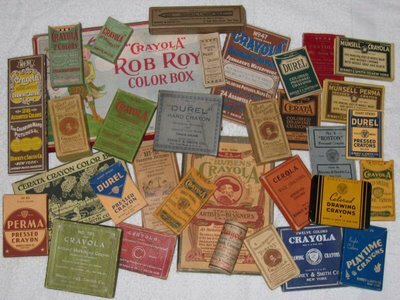 It also helps that when you display over 3000 different crayon boxes together that range from the late 1800s until now and feature the likes of everything from Mr. T to Howdy Doody, Popeye to Pac Man on a box of crayons, there really isn't a need to have to have those deep psychological discussions with your friends and visitors. 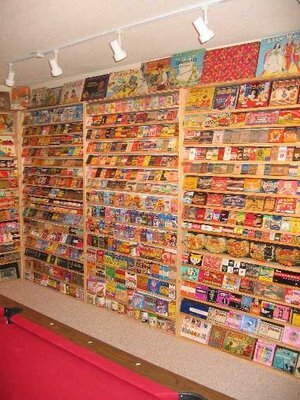 Once they had stepped into my collection room with every single box displayed neatly into a visual stimulating overload of colors and graphics, they were simply speechless. I don't know what makes a person a collector. Certainly we started out as hunters and gatherers. The very act of gathering is essentially forming a collection. Of course, back then the options for collectors were a little more severe. Complex choices like: Keep the food collection or die of starvation. Keep the lovely eight species firewood collection or freeze to death. Yep, that poor guy they pulled out of the glacier in the alps several years ago: the first firewood collector! Let's not forget the hunter side of it either. No, I'm not talking about running around with GI Joe camo clothes on in some primal pursuit of poor Bambi here. I'm talking about the need to search it down. To find the elusive missing item. To discover what has yet to be discovered. To be the first to assemble them all togther in their completeness. Of course, come moving day, this romantic ideal goes right out the window as I'm packaging up the 24th box of crayons and the 800th piece of shelving. Non-collectors, minimalists; they simply don't understand. But when I turned a $200 purchase of 9 old beer cans into $14,000 in cash; they suddenly had a more optimistic viewpoint of the entire concept. Skip the collecting part, how can I do that?!? Sorry folks, you can't and I can; and that's just the way it is. Try the stock market, I'm sure you can do circles around my abilities to make money there. Meanwhile, I'll get rich the obscure and fun way; through collecting values. After all, if you can't beat 'em, join 'em!